Vision boards are basically collages of inspirational people, quotes, and visuals representing personal goals. 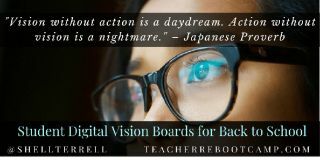 At the beginning of the school year we can get students focused on setting and accomplishing learning goals and personal goals by getting them to create digital vision boards. Vision boards are basically collages of inspirational people, quotes, and visuals representing personal goals. Extremely successful people swear by them. In fact, this was an idea inspired by The Secret by Rhonda Byrne that I wrote about in 2014 and included in my book, The 30 Goals Challenge for Educators: Small Steps to Transform Your Teaching. I’ve been getting my students to create digital vision boards instead of poster vision collages and share two templates/versions with you below and my students’ examples. Find more student examples here. This is one free Buncee template I created for any teacher or student to copy and edit as they wish. This past year my students also chose One Word to inspire them and added this to the digital vision board. Read more about this in my post about One Word Digital Vision Boards. This is the free Buncee template for the One Word Vision Boards. Whichever idea you try the idea is for students to revisit their boards regularly to keep them focused on their goals and inspired. I get students to do this by getting them to reflect in their journals at least once a month on what they are doing to accomplish the goals they set in their vision boards. Below, are a list of additional free web tools and apps for creating vision boards with a few examples. Buncee– educational web tool and iOS app where students add digital content (free images, audio clips, YouTube video, videos, voice recordings, stickers, etc.) to a board to create presentations, collages, posters, and so forth. Google Slides and Google Draw are other options. You could easily use this Buncee template in Google Slides. Genial.ly is a free multimedia tool for creating dynamic digital presentations and interactive images. Padlet and LinoIt are other ways to create a vision board or set goals with learners. Check out this example of my class goals here and an inspiration board here! Pinterest– free and popular curation web tool, iOS/Android app, and bookmarklet to easily pin inspiring posts, documents, videos, and images to a board. Canva– web tool and iPad app with a free library of stock images, stickers, and graphics. EduGlogster– web tool and app that allows students to combine their own images, graphics, audio, video and text to create a multimedia scrapbook. Smore– web tool to create digital flyers with videos, icons, and images. Some teachers have used this web tool to create infographics. Pic-Collage– iOS/Android app for creating visual collages that can include video. Also, find a library of stickers, frames, and templates. VisionBoard.cc– Chrome extension to create a vision board and set it as a homepage. Challenge: Start the school year right by getting students to create vision boards.